The Rockin’ Berries: Back to the music! 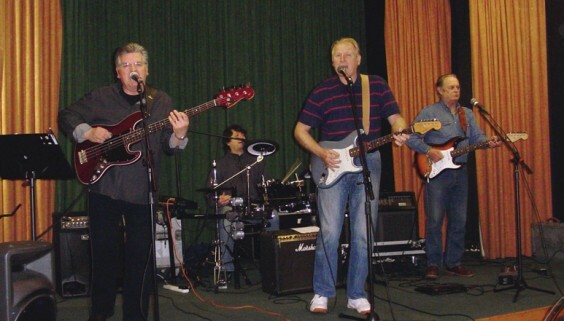 Back in the dawn of the 1960s, when Geoff Turton and Chuck Botfield were embarking on a pop career as fresh-faced exponents of ‘Brumbeat’, they could surely never have imagined that they’d still be in a band together – and still pulling in the crowds – some 50 years later. The fact that they are doing just that is a testament to their friendship, their musicianship, their willingness to adapt to an ever-changing music industry – and their determination to have a damn good time whilst doing it. Geoff, Chuck, the Berries’ drummer Simon Ryland and new bandmate Rick Price (formerly of The Move, ELO and Wizzard) have gathered at The Stadium Club in Kings Heath to rehearse for their upcoming series of gigs, arranged by good friend and “50th anniversary manager” Bob Lawton. The story of the Rockin’ Berries really begins at Turves Green School in Northfield, where Geoff and Chuck met at the age of 10 – and it was also here that they discovered their mutual love of music, playing clarinet in the school band! Chuck went on to art school in Birmingham and formed a skiffle group called The Bobcats (featuring a fellow student by the name of Christine Perfect, who went on to achieve fame with Fleetwood Mac as Christine McVie). After a brief period with the unlikely title of Archimedes Deal – Chuck still cringes about that name – the group eventually became the Rockin’ Berries, partly in tribute to Chuck Berry, who not only shared his first name with Chuck but was also a major musical influence on the group. Meanwhile, Geoff and his friend Bob Lawton had formed a group called The Chimes (later to become The Swinging Chimes), but it was to take several years and many personnel changes before Geoff and Chuck both featured in the official Berries line-up. Like so many up-and-coming bands on the Midlands scene (and probably across the UK), members seemed to swap around on a frequent basis, leading to an extensive and complex ‘family tree’ of musicians and a huge melting pot of talent and ideas. “When we left school and college, it was harder to be part of a band because of job commitments, so that was another reason why the line-ups changed quite a bit,” Chuck explains. 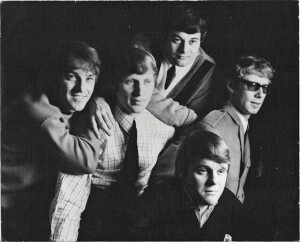 The Rockin’ Berries, who by November 1961 consisted of Chuck, Doug Thompson, Tim Munns, Terry Bond, Dennis Ryland, Paul Hewitt and Jimmy Powell, had become pretty well-known in the local area and were offered some bookings in Germany – all except Hewitt jumped at the chance, and he was replaced by Clive Lea, a singer and impressionist who had also found fame on the local scene. The Germany gigs were successful and the band were invited to extend their stay, but older members Doug, Dennis and Jimmy had family commitments at home and decided to return to the UK, effectively splitting the band in two. In need of another vocalist, Chuck gave his old mate Geoff a call and asked him to join them, which he did, abandoning The Swinging Chimes just when they had been invited to perform on Sunday Night at the London Palladium! “He left me right in the s—t!” Bob remarks good-naturedly. It was in Germany where the Berries (whose bassist Tim Munns had now been replaced by Roy Austin) developed their signature musical style – quite by accident, as it turns out. “We had decided to make a recording of Frank Ifield’s I Remember You for one of the lads’ girlfriends back home, and I began singing – and discovered that I could do a falsetto voice!” recalls Geoff. “Until then, I’d only sung backing vocals. In fact, I still find it hard to co-ordinate singing lead and playing guitar – that’s why we need Rick in the band now!” (“I was the only one they could get!” quips Rick). This discovery enabled the Berries to include songs by the likes of The Four Seasons and The Beach Boys in their repertoire, which was already massive by anyone’s standards – they routinely performed six or even eight 45-minute sets in one night, playing from 6pm until 2am. The Germany tour also marked the beginning of the group’s knockabout comedy routines, which made their act different from most other young bands. Was it Clive Lea’s pedigree as an impersonator that led to the inclusion of cabaret? No, says Chuck; it was boredom, pure and simple! “I decided to wear a wig, and later some women’s clothing too, and it became a bit of a cult thing; people kept requesting it,” shrugs Geoff nonchalantly. “He discovered his female side!” Bob can’t resist adding. Chuck adds that during long journeys to gigs in their van, Clive would keep the others entertained with impressions of Cliff Richard, Spike Milligan and Billy Fury (“he looked a bit like Billy, actually,”), so the band put together a whole routine based on the popular Benny Hill song Transistor Radio, which featured impersonations of several singers and personalities. On their return to the UK (a journey involving a farcical run-in with customs officials – you’ll have to wait for the memoirs), the Berries were signed by Decca (under which they released two singles and appeared on Ready Steady Go!) and then Piccadilly, a subsidiary of Pye Records. After releasing I Didn’t Mean To Hurt You, they played London’s famous Marquee Club, where they attracted the attention of influential US producer Kim Fowley. It was Kim’s idea for them to re-record a song called He’s In Town (originally performed in America by The Tokens), and this gave the Rockin’ Berries a No. 3 hit in October 1964. Poor Man’s Son also reached the Top Ten, while the album In Town got to No. 15. Although the band were at a disadvantage in not having their own songwriter, they did have something else in their favour – the cabaret part of the act. So even when the pop scene began to change at the tail-end of the 1960s, threatening to leave the ‘beat’ groups behind, the Rockin’ Berries (now featuring Bobby Thompson on bass) were still in high demand. They were booked for a series of summer shows at Great Yarmouth, where they found themselves sharing the bill with The Bachelors and a young duo called Elaine & Derek, aged just 15 (Derek Thompson went on to become a household name as ‘Charlie’ in Casualty!). The Rockin’ Berries went down a storm with the crowd, but weren’t so popular with their fellow artists. Apparently The Bachelors’ management were not happy that the Berries were so well-received – especially their rendition of The Way You Look Tonight in four-part harmony, which they attempted to get taken out of the routine – while Elaine & Derek’s management told the youngsters not to fraternise with the Rockin’ Berries, who would probably lead them astray. Well, you can’t say something like that and NOT tell the story, so Geoff concedes. “When we were in Germany, we became friends with some British Army lads who were stationed nearby, and when they found out we hadn’t got anywhere decent to sleep, they decided to ‘borrow’ some beds – and some food – for us! “They delivered them to the nightclub in an Army lorry and we all had a bit of a joyride, but unfortunately one of them left his ID card in the cab, so the Army knew exactly who’d done it… we were terrified when we were hauled in front of the authorities, although we laugh about it now!” he reveals. You get the feeling there are many more tales of laddish hi-jinks, but the Berries had to be on their best behaviour when they were invited to play at the 1967 Royal Command Performance in front of The Queen and Prince Phillip, alongside the likes of Tom Jones, Lulu and Tommy Cooper (“We’ve got a story about Tommy, but we’re not allowed to tell it!” Chuck grins mysteriously). The following year they returned to the London Palladium as guest stars on the Des O’Connor Show for a 28-week season, but things were changing once more for the band… Geoff had decided to seek pastures new, initially to join Birmingham group Sight and Sound, then to pursue a solo career as “Jefferson”. While he enjoyed some success on both sides of the Atlantic with his brand of so-called “sunshine pop”, unfortunately a car accident landed him in hospital for several months and he was unable to promote his single and album sufficiently to achieve superstardom. He rejoined the Rockin’ Berries in the early 70s. The subsequent years saw several more personnel changes: Clive Lea had departed to work as a solo impressionist in 1970, being replaced by singer and impressionist Terry Webster, while drummer Terry Bond eventually moved into management. Since 1998, tub-thumping duties have been carried out by Simon Ryland, formerly of 70s group Racey. You could almost say that Simon was born to be a Berry – his father Dennis was an original band member, one of the three who took the tough decision to quit after the first stage of the Germany tour. “I’ve known all the guys for many years – in fact I was best mates with Chuck’s son and played in a band with him at the age of 15,” says Simon, whose relative youth does not prevent him from entering fully into the constant banter between the band-mates. Simon joined the Berries to take over from one of his drumming heroes, Keith Smart, who had played with a number of Birmingham groups – most notably Wizzard. The Berries inform me that the social club where this rehearsal and interview is taking place, and where the band will be performing at the end of May, is actually owned by Keith (“That’s how we get it cheap!” laughs Chuck), and the man himself later makes an appearance – sadly minus the green hair dye he favoured in his glam rock days. Keith provides a direct link to the newest member, Rick, who was drafted in as the main bass player so that Geoff could always sing the lead. However, this is not the first time that Rick and Geoff have featured in the same line-up – Rick was a member of the aforementioned Sight and Sound when Geoff joined them. “Mind you, he left to join The Move when I’d only been there a month!” Geoff points out. “Yes, that was a shame in a way because Sight and Sound was a great set–up – but Roy Wood asked me to be in The Move, and I was hardly going to say no!” says Rick, who went on to join ELO and then Wizzard. Speaking of Mr Wood, did he really write (and perform backing vocals on) a song called Yellow Rainbow for the Rockin’ Berries, as has been rumoured? “He did indeed – that was our psychedelic era!” Chuck confirms, sparking off reminiscences about Wizzard’s unusual dress sense, which at one point saw Rick bedecked in roller skates, cricket pads and wings… (Yellow Rainbow remained unreleased until 2006 – it’s on their current CD, They’re In Town). There’s one more member of the Berries who needs a mention: Jay McGee, who provides vocals and impersonations for the band’s cabaret act, for which they are still in high demand. However, the list of gig dates is increasingly featuring “All Music” performances, which eschew the comedy to concentrate on the music. The current run of concerts therefore include all the Rockin’ Berries hits and classics from The Move and Wizzard, plus a homage to all the group’s major influences, such as the Everly Brothers, Beach Boys, Buddy Holly and – of course – Chuck Berry. “It was time to get back to our roots,” says Geoff, and what better time to do it than their 50th anniversary? The past 50 years may have seen many incarnations of the Berries, but the easy camaraderie and knockabout sense of humour has remained constant, and shows no sign of diminishing. And, fittingly for a group that evolved from the family tree of Birmingham bands, the current Berries have maintained contact with several former members. For example, original drummer Terry Bond recently got married for the first time at the grand old age of 66, and had a party at Bromsgrove’s Holiday Inn, at which all the members from the 1965 line-up were in attendance. I used to play piano in both Rockin’ Berries and Swinging Chimes. I joined the Berries when Christine Perfect left. I then left Berries and joined Chimes and in fact I was in the line-up in October 1962 in Smethwick when they shared the bill with The Beatles. I’m very proud of that. Unfortunately I don’t have any photos as a record of my time with either of the two bands and I’m wondering whether any of the original band members do? If so I’d like to hear from them.